Baseball varsity jackets are typically worn by young men on the baseball team, but with so many girls playing baseball these days, these jackets are also becoming popular for girls. 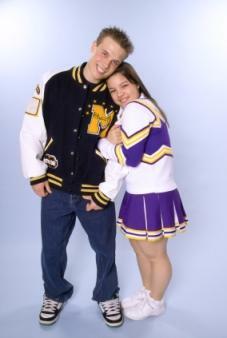 Cheerleaders may also want their own varsity jacket to mark their achievements in the sport of cheerleading. There are two main types of varsity jackets, no matter which sport you play. There are leather jackets with leather sleeves. These tend to cost a bit more, but are durable and built for wear in colder weather or cooler climates. Also available are cloth varsity jackets, which tend to be lighter weight and cost less. If you're in the market for a cheap varsity jacket, then you may want to focus on the cloth version more than the leather. Perhaps you are a cheerleader, but your boyfriend plays for the baseball team. He may want you to wear his varsity jacket to show that you're his girl. There are many different style options for wearing a baseball varsity jacket and luckily the jacket will go with just about everything. You can just as easily pair the jacket with jeans and a shirt as with your cheerleading skirt. Since the jacket will likely be too big for you, you may want to put a hoodie or smaller, lightweight jacket under it that is zipped and then wear the jacket open on top. Since you'll want your jacket to be a reflection of your personality, you should feel comfortable getting any type of patch or emblem that means the most to you. Christian athletes might want to include a small cross on one shoulder, for example. Another option is to purchase a plain jacket you find on sale and add your own patches. The overall look can turn out looking homemade, so be certain that you are going to like the outcome before investing the dollars. If you like a homespun look, you may want to check out unique Baseball Patches and visit local stores such as Hobby Lobby and Wal-Mart for even more ideas for patches that can be added. A good sewing machine will help you embroider your name and other information on the jacket. Many sewing machines even offer templates to make this task easier than ever before. Not good with a sewing machine? Enlist the aid of family and friends and get the seamstress in your life to help you create the unique jacket of your dreams. Baseball varsity jackets can provide warmth and a lifetime of memories from your high school glory days. Take the time to find the perfect jacket and you're sure to enjoy it for many years to come.